“If you are able to wrap your arms around the pillar completely, you will be showered with good luck.” That is the most common story told about the Delhi Iron Pillar. The story of this pillar is more interesting and deeper than one of having long arms and being lucky. The Iron Pillar stands next to the famous Qutab Minar and is often called the Delhi Iron Pillar (DIP) but is also sometimes referred to as the Mehrauli Iron Pillar (Mehrauli is the town in Delhi where it is located). It stands about 6.7 meter high with just 0.5 meter below the ground. Its diameter varies from just 4 cm at the top to 42 cm at the bottom. It weighs around 6.5 tons. Similar pillars are also present in Dhar, Madhya Pradesh, Kodachadri hills, Karnataka, Mandu, Madhya Pradesh, Mount Abu, Rajasthan and in temples in Orissa. The DIP is a reminder of a fading heritage of excellence in engineering and metallurgy. There are many theories on the pillar and very few scientific studies have been done. But recently the work of R. Balasubramaniam of IIT, Kanpur helped shed light on the science and engineering behind this pillar. Using varied techniques like X-ray diffraction, Fourier Transform Infra-Red spectroscopy and Mossbauer spectroscopy, and a thorough study of history, he presents a well researched analysis of the DIP. The story of the DIP starts in 410 CE during the time of Chandragupta II Vikramaditya. The original location of the DIP was actually in Vishnupad Giri (Vishnupadagiri), the area generally accepted to be the Udayagiri hills. As Chandragupta II was a great devotee of Vishnu, the pillar was erected in the honor of Vishnu with the image of Garuda possibly placed on the top. There is ample evidence of the adeptness of the metallurgists who built this and similar wrought iron pillars. They excelled in iron extraction, shrink fitting methodology, forge welding and other techniques. The pillar has three sections. The top part that has a bell capital on top, the main body and the part that lies below the ground. The decorative bell capital was fitted onto the main body using the shrink fitting methodology. Shrink fitting is a procedure in which heat is used to produce a very strong joint between two pieces of metal, one of which is to be inserted into the other. Heating causes the hole to expand into which a properly fitting piece is inserted. When the outer piece cools down, it shrinks back to its original size and frictional forces create a highly effective joint. The manufacturing technique of the body involved elaborate and ingenious processes for using hand-held hammers, heating iron, using inserts, dices, handling of the body while in constructions and surface finishing. To understand what exactly was used to make the pillar, one has to ask an obvious question. Does the pillar really never rust? To say so is misleading. The pillar actually does rust. And in that rust lies it’s capability to survive. There are two kinds of theories about the DIP. One is environmental. According to this, the answer lies in humidity of Delhi region. Relative humidity of Delhi never exceeds 70% for significant period of time which results in very mild corrosion of the DIP. The other theory is about the material used. Among other things, presence of Phosphorus (Atomic Symbol: P). It is presence of this Phosphorus and Copper (Cu) that turn rust from iron’s enemy to its friend. The formation of this amorphous layer forms a continuous layer above the metallic surface. Ordinarily, the rust forms layers in discontinuous manner and is not protective. There is no protective coating of any sort that was artificially applied on the pillar. This is confirmed by the fact that recently exposed parts of the pillar attain the same color as the rest of the pillar due to a newly formed layer of protective rust. In other words, one can say that the pillar produces its own protective layer, a property that allows it to withstand dust and rain. R. Balasubramaniam’s research shows that it is combination of environment that triggers growth of rust layer and the material the pillar is made of that leads it its longevity. Thomas J. Coyne, Jr., who heads an engineering company and has experience working in India noted that since hand working was involved and the casting was in actuality hammered into shape, that would lead to a dense exterior which too could be a reason for better rust-resistance. The presence of Phosphorus is not considered accidental. This addition was intentional as iron produced in earlier time in same areas did not have presence of Phosphorus. There was also lack of use of lime (CaO) in the flux, which is used in modern days. Little less than half the age of the Pyramids in Giza, one wonders how long the DIP will last. Modern encroachment of the pillar is indeed bad news. The worst affected are the part of the pillar that is buried underground. Digging in the 1870s had revealed a bulb-shaped bottom, much like an onion, with eight short thick rods attached to it. The re-erection was done by Joseph Beglar. He was an eminent Chinsurah Armenian who worked with the Bengal Government as an Executive Engineer and Archaeological Surveyor in the Bengal Public Works Department. The re-erection was done by constructing a stone platform and a coating of lead was applied on the buried underground surface of the pillar. When Archaeological Survey of India (ASI) re-excavated the site in 1960s, they found the lead coating in an excellent state of preservation, but the buried portion was found covered with rust layers ranging from a few mm up to 15 mm. Unfortunately, ASI continued with usage of lead (it protected the underground part from direct contact with mortar and the saline soil) even though many experts strongly disagreed with this tactic. Thus, the present corrosion rate of iron in the buried regions is much more than that of the exposed surface. Apparently, the ASI believes that if it looks fine on outside, everything else is fine. Alternatives suggested (like epoxy-based coating) were, for some reason, ignored. Though a simpler way, as Thomas Coyne pointed out would be to raise the pillar to above ground to reduce the effect of subterranean re-oxidation. Does the significance of DIP lie in history only? Can modern metallurgist learn anything from it or is its composition and production technology not viable in the industrial times we live in? It is not very clear how the insight into the engineering practices involved in making of DIP, the metallurgy or the chemistry is useful to current Iron works industry in more practical terms. But this is also the result poor dissemination of information gathered about DIP. 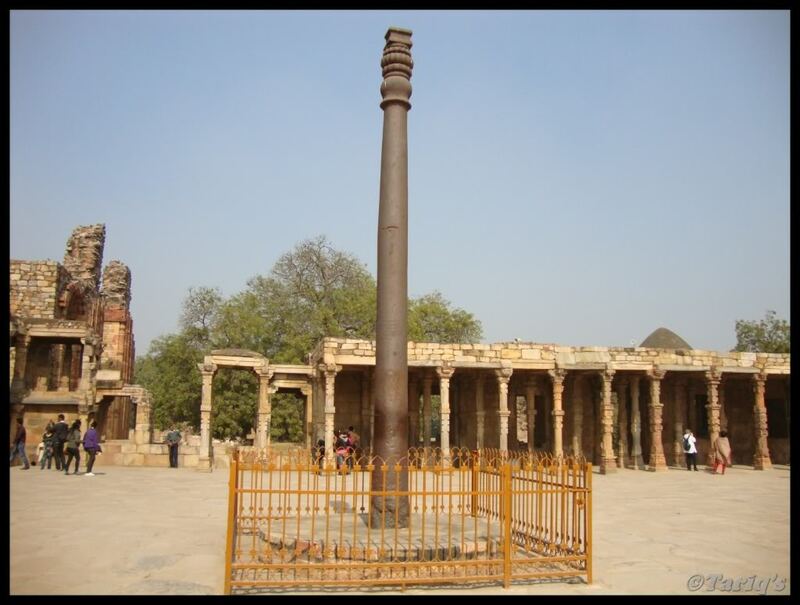 Although the Delhi Iron Pillar attracts the most attention, there are several other large ancient iron objects in India. There is dire need to initiate study of these objects on larger scale. Lesson and knowledge, even if from our past, should not be forgotten. Careful archaeological excavations are necessary at Udayagiri Hills to firmly confirm that it is the original location of the DIP. Most importantly, the lead sheet that covers the buried underground part of the pillar must be replaced soon. DIP is an important cultural and scientific object. It is a proof of Indian civilization’s ability to produce very high quality products. A lesson we need to relearn.